Yes! I went Penang again! For the 3rd time, for the food again! Well, slightly different this round, stayed for a whopping 4 days, rented a car, got to see beautiful sunset at the Batu Feringgi, travelled around Penang…. thou not anytime sooner, but will definetly come back again to stay at their beachfront hotel…. 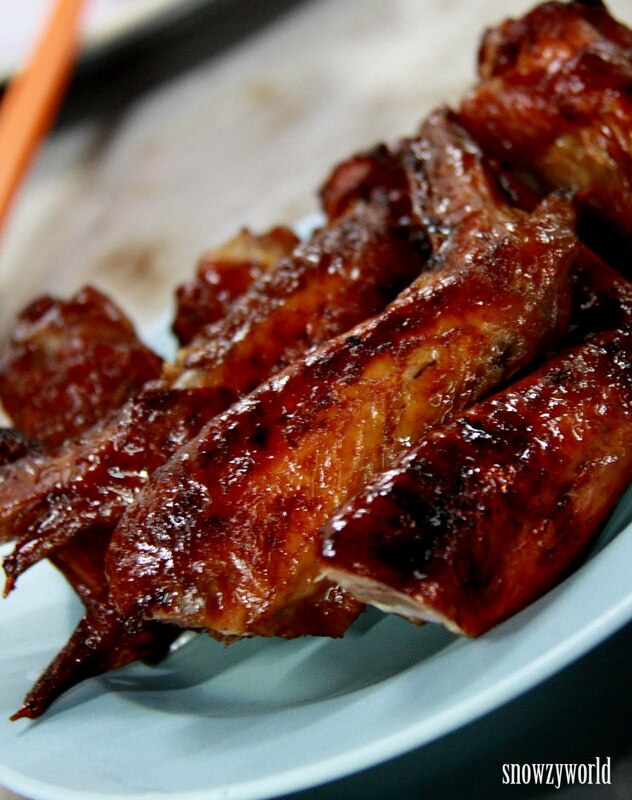 It’s a wind whirl tour of Penang best kept food secret. Around the historic city of George Town, we went from coffeeshop to hawker to shopping malls… it was eat, eat, eat, and eat in Penang. Came here twice for the Otah and Roti Babi which is a must-try dish here. Penang Otah, unlike those we have here, is soft and watery. I tasted once at Gurney Drive’s “Newton Circus” equivalent and hated it, too soft and watery. However, this one at Song River was good! Soft yet still firm with big pieces of fish meat in it, taste of some herbs, mint? or lemongrass? Nice! 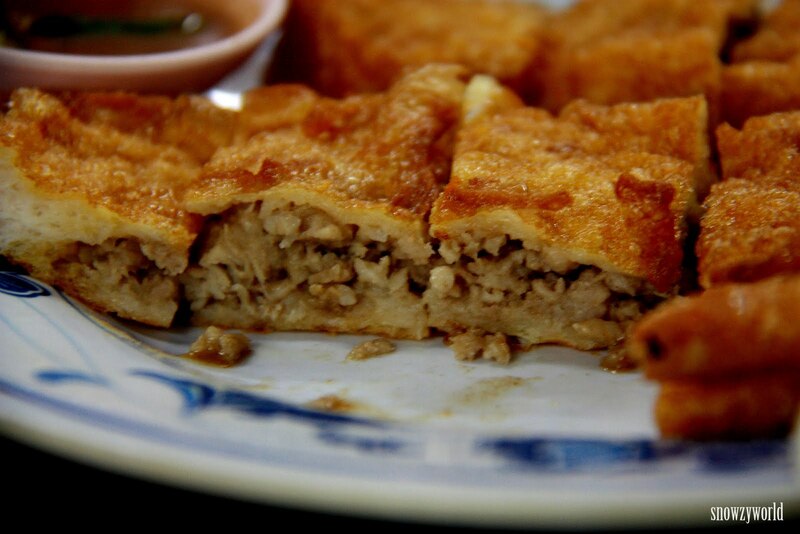 The Roti Babi, is something like Roti John in Singapore, but it’s minced pork in bread and deep fried. Well, you see the oil oozing out but you don’t that oily actually. 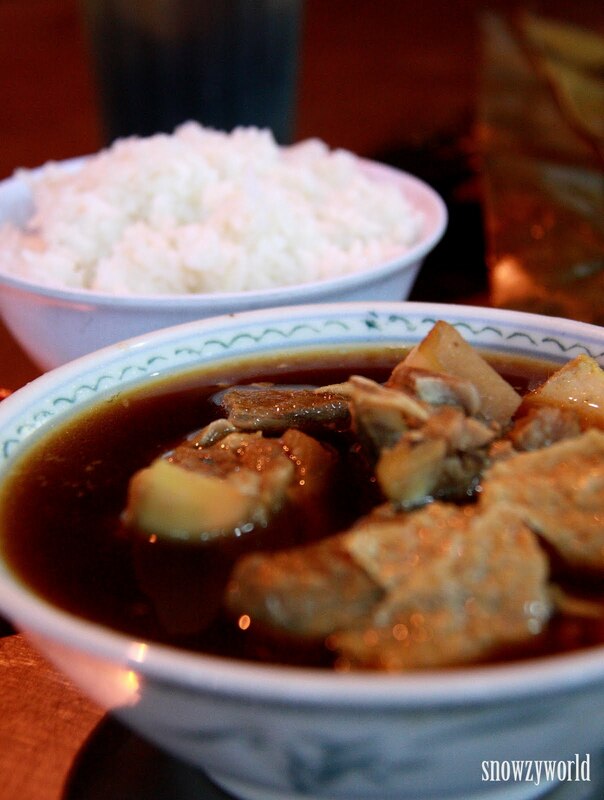 The , Bak Kut Teh (肉骨茶) was not bad, it’s the herbal soup base which I like. Also tried the forgettable Orh Jian (蚝煎), Sotong Bakar, chicken wings and Lor Bak (卤肉). It’s seems a famous eatery, at almost 3 in the afternoon, the place was still filled with people for lunch? or tea break? For us is definitely lunch. Well, after tasted the food, it not crowded for nothing, believed the best Orh Jian (蚝煎) and Orh Mee Hoon is really here! The oysters were fresh (according to Kenn & Alicia). The starchy blend or the Orh Jian was crispy and delicious, so different from what we had in Singpore, oozing out flavourful taste. 赞! 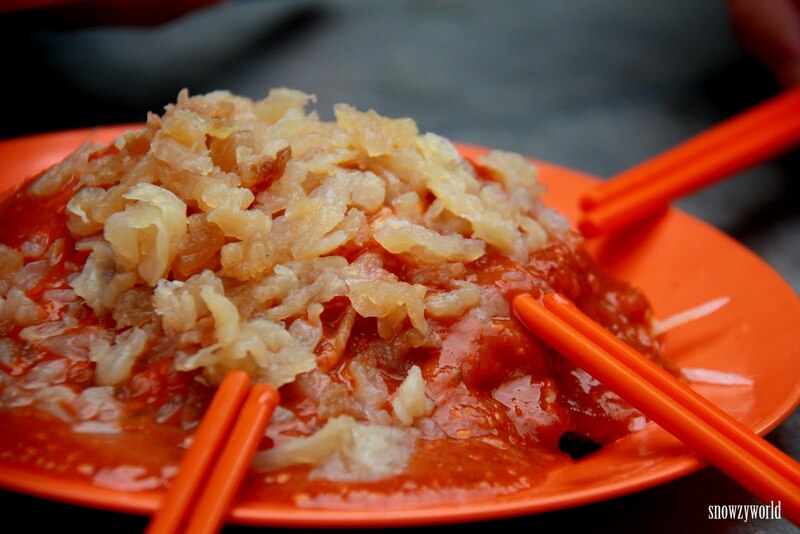 The Orh Mee Hoon, almost like a dish of crab tang hoon, tasty and was finished in just a minute or so! 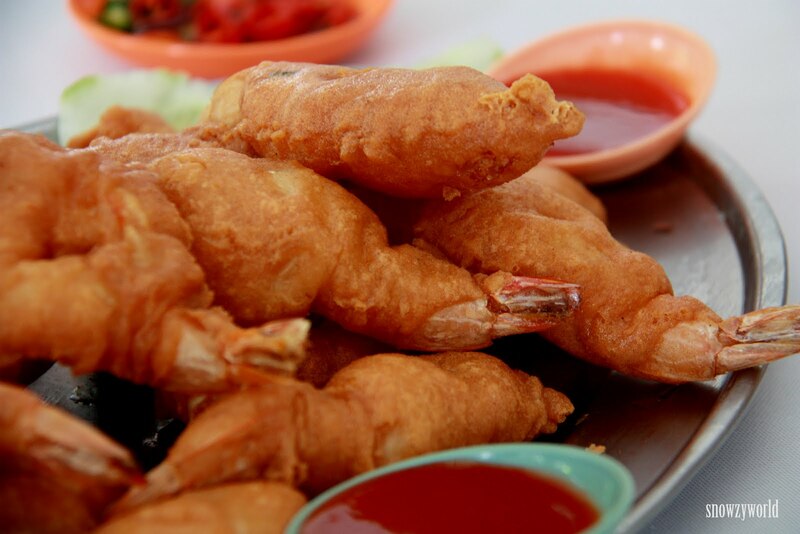 There’s also the Prawn Fritters, I wonder how they do it. 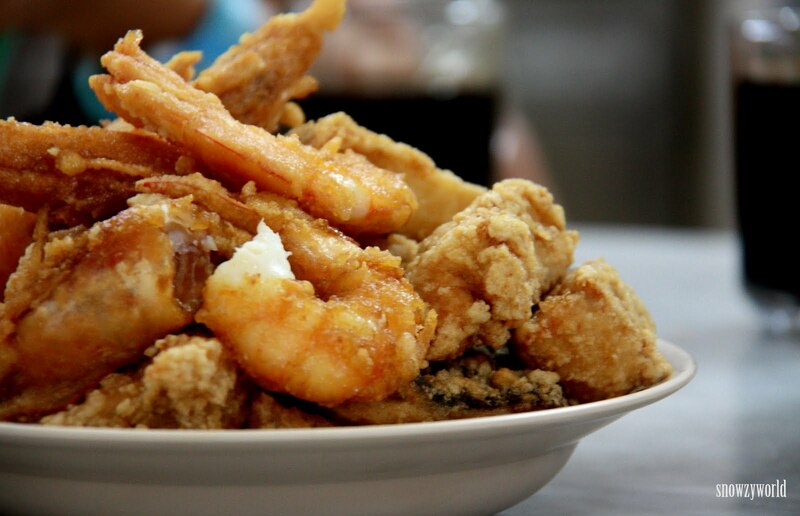 It was so crispy outside yet the prawn maintain it’s crunchiness and freshness. 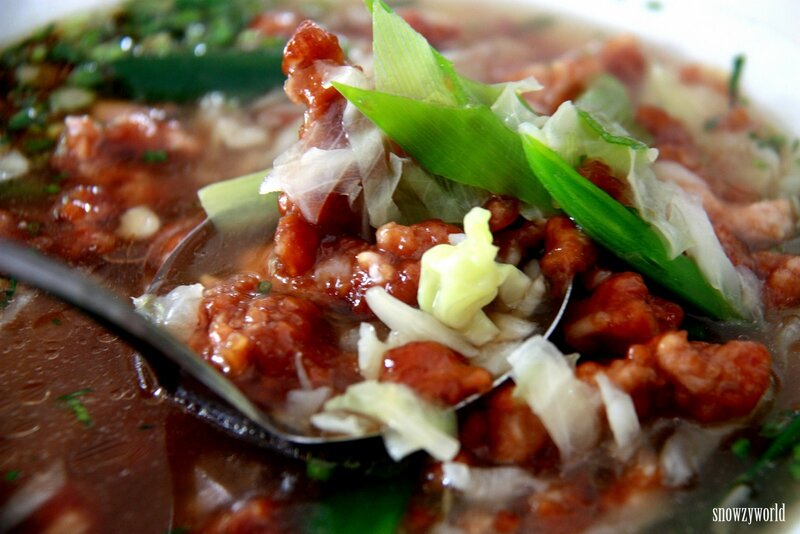 Also ordered the Sweet Sour Pork Soup (咕噜肉汤). At 1st sight we thought the meat was pork lard! Are we going to eat pork lard, are we drink the pork lard soup? Well, it turned out to be just pork meat, still prefer the normal 咕噜肉 with my rice and sunny side up. It was a really hot day at Penang despite shower in the morning. 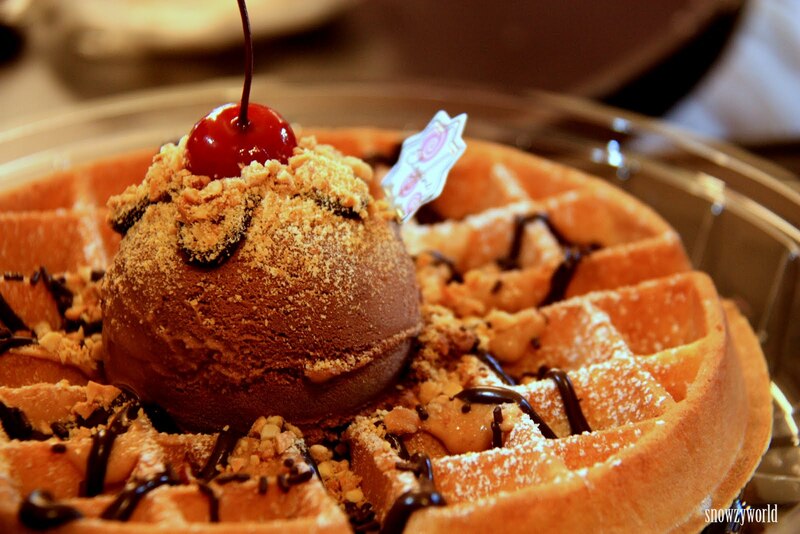 We decided to hide in the air-conditioned shopping mall and eat another of our favourite in Penang — Waffles! Another must-go place in Penang. In the morning, go to the cafe and have the fried fish with mee hoon. Using fresh Threadfin Salmon, it was sold out by 10am! Crispy, the fish meat was soft and so fresh. It was even better this 3rd time I am here! 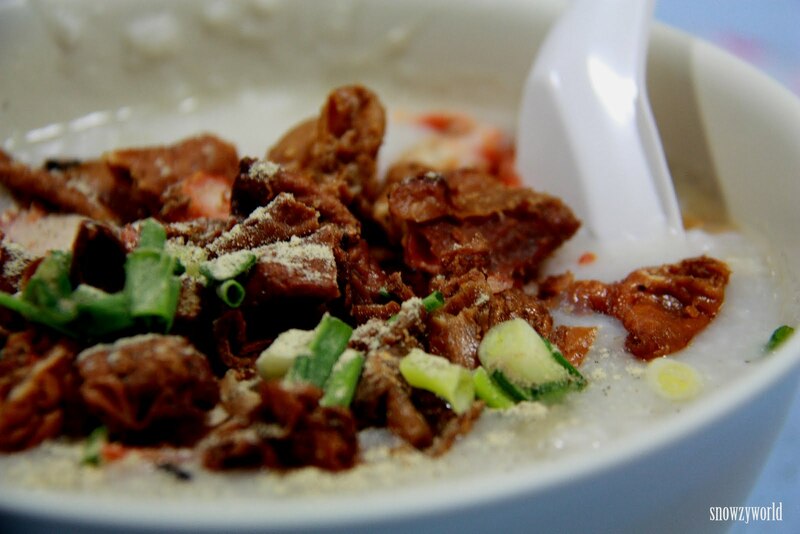 At night, soak yourself in the pasar malam atmosphere and try our favourite Pig Intestine Porridge (猪杂粥). The porridge was smooth, tasty with char siew and all sort of pig intestines fried to ultimate crispiness mixed in the porridge. The ingredients just somehow blended in with the plain porridge. Yummy! 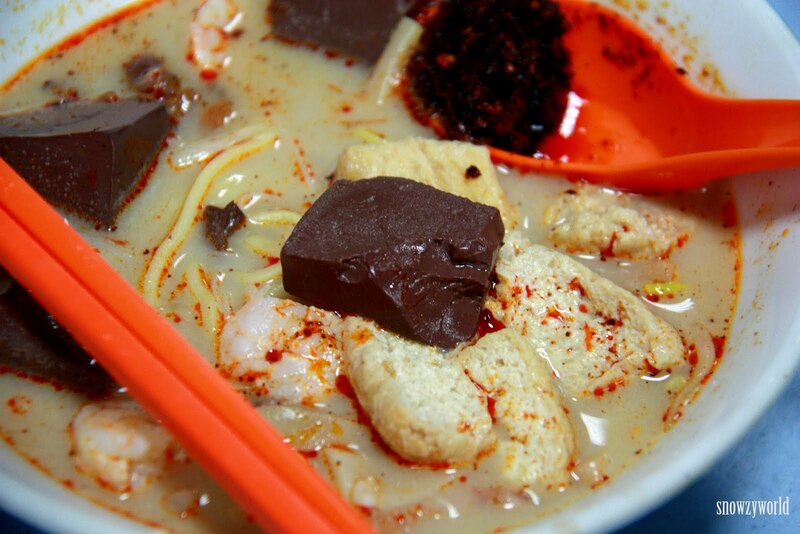 Try their Curry Mee (咖哩面) as well. Thick curry soup and for people who like the pig blood, eat this! Also tried the Lor Bak (卤肉). Not to be mistaken with those Taiwanese style, Singaporean style lor bak, Penang style lor bak is really like the Ngor Hiong (五香), but instead of minced pork meat and water chestnuts, the meat based is roast pork sio bak (烧肉). Than you will eat with other food like century eggs, fried beancurb, some fritters (just like in Singapore’s 五香 with mee hoon). 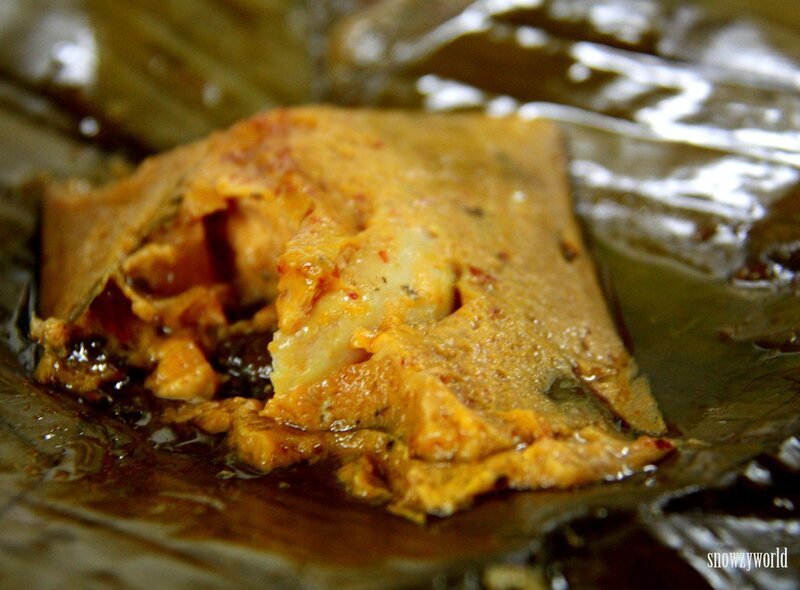 Actually the best lor bak is still at another coffeeshop in Penang — Kek Seng Cafe (格成餐室) along Penang Road, 384 & 382. This place has the best Ice-Kachang and Pasembur. Especially the Pasembur, meant Indian mixed fruits but with no fruits to be found in the dish. It’s cucumber plus crab meat (it’s the real meat not those crab stick), potato, eggs, fish cakes and thought there’s jelly fish or?? mixed with spicy peanut sauce. It’s surprisingly refreshing espcially under this heat. If you want Pasembur, Padang Brown is your number 1 choice. Did not try the Ice-Kachang this round, but tried the Chendol instead. It’s top with thick and sweetened red bean. Enhanced with coconut milk sweetened with gula Melaka giving the aromatic flavour. Tried the Poh Piah here. 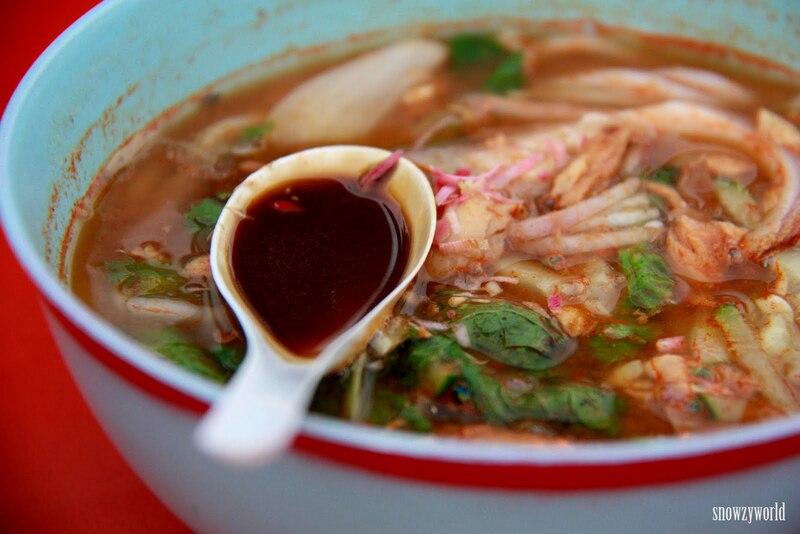 Penang style is wet (some soup base under the poh piah) with the usual ingredients and fresh crab meat. I am able to appreciate it this round starting to accept the poh piah to be “wet” instead of the usual dried ones. 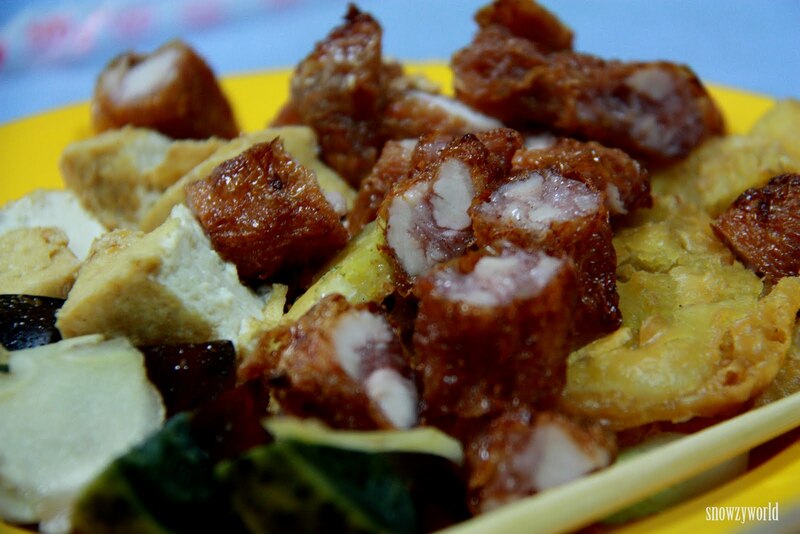 Rounding off here is Yong Tau Foo look-alike. Clear soup and I see greens! Finally some vegetables! There’s only about 3 food stalls here (other than the drinks), but it housed the famous Penang Char Koay Teow here — Ah Leng Char Koay Teow. Prepared for a long wait, we waited for 30 minutes but was worth it! Ordered both the normal (RM5) and special char koay teow (RM9.50). The verdict? The special one tasted better. Well, it got to be at that price, with 4 fresh prawn fried till semi-cooked leaving it so crunchy, mantis shrimp, cockles at medium cooked. 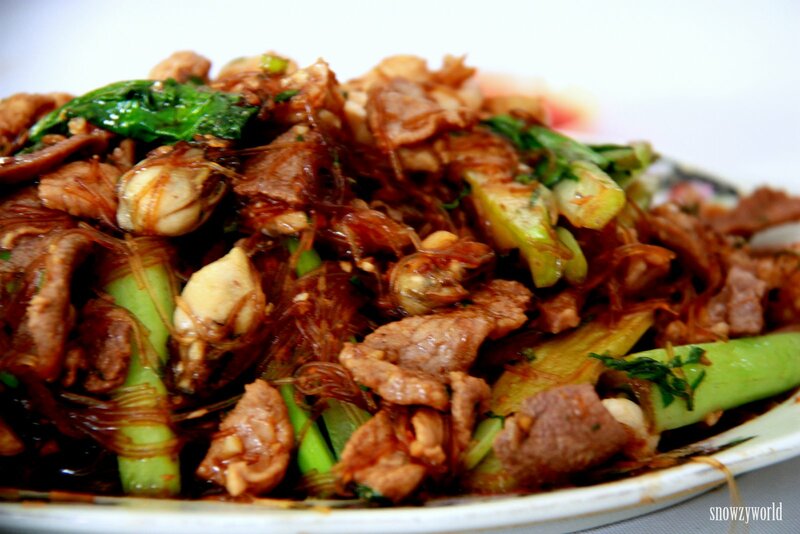 The fried koay teow is neither wet nor dry and it’s not so oily as those in Singapore. 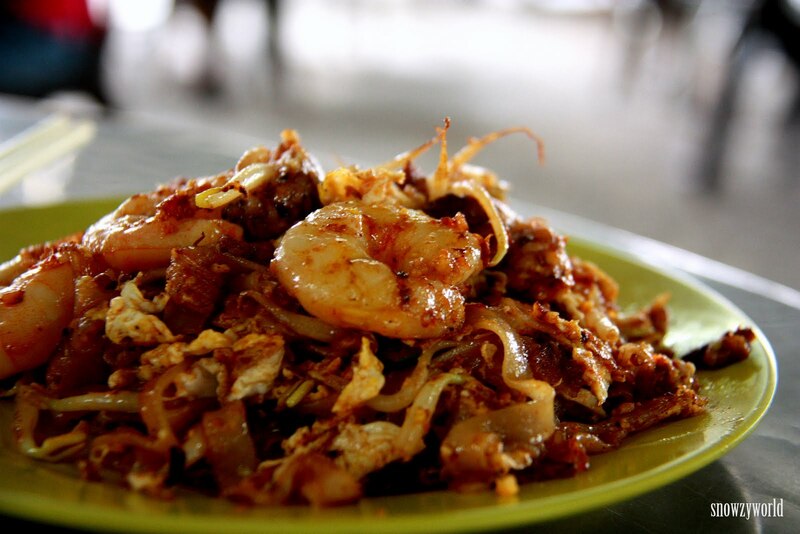 Of course, tried many char koay teow in Penang, other than this, another memorable one is at the Gurney Drive Hawker Centre — remember stall # 107. Also ordered the Hokkien Mee (福建面), again a different version from what we normally had in Singapore. 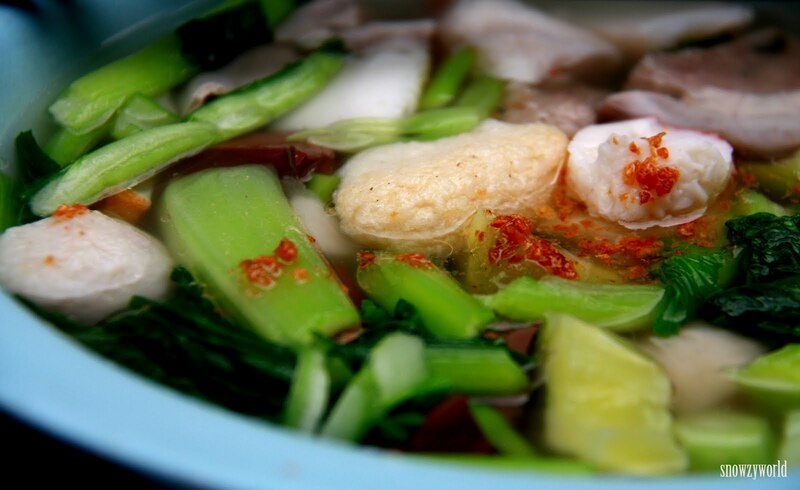 This is noodles in prawn and pork soup with slices of pork, prawns, hard boiled egg, vegetables, beans sprout and sprinkling of deep fried shallots. Worth a try here. Assam Laksa. A far cry from our sweet, coconutty version, this comes with sour broth flavored with tamarind or also called assam with pureed fish, fruits, veggies and chili mixed in. Though I still prefer our version, but the Penang’s assam laksa still give you a hint of cool and refresh factor even under the hot sun! So which version you like it, the sweet or the sour? Had tried in different places in Penang, heard the best is at Ayer Itam Market, near Kek Lok Si Temple. Kenn’s mum said the best is in Balik Pulau. Let me know which is good if you get to try. 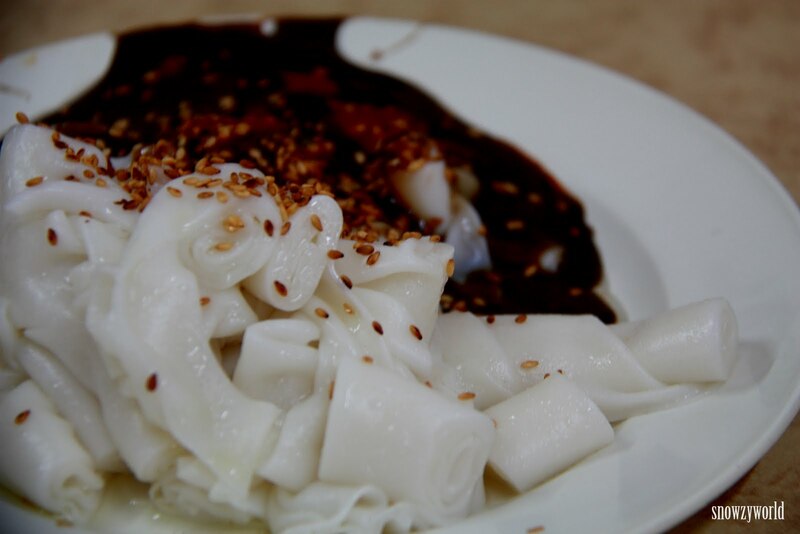 Chee Cheong Fun. 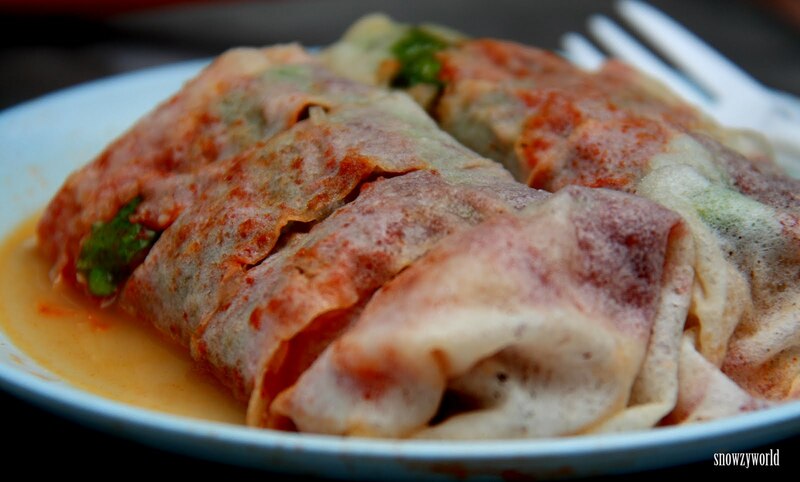 Made of rice flour, steamed and rolled up to about 10cm long to resemble the pig’s intestines. Penang’s version is different from what we usually at here and Hong Kong. 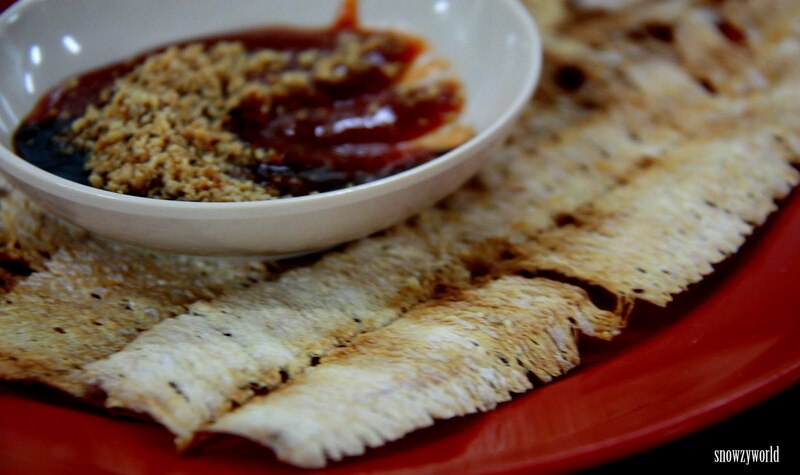 Here, it is served with a mixture of chilli sauce and shrimp paste (Hae Ko), thick red sweet sauce and sprinkled with roasted sesame seeds. Well, the hi-light is really the shrimp paste. We ate at Seow Fong Lye Coffeeshop, 94C Lorong Macalister. Of course there’s still many food to try in Penang, like the Char Koay Kak, Koay Teow Th’ng, A-pom, Roti Canai, Roast duck, Wan Tan Mee, Penang Rojak, etc. Some I’ve ate during my last 2 trips, some not tried yet. 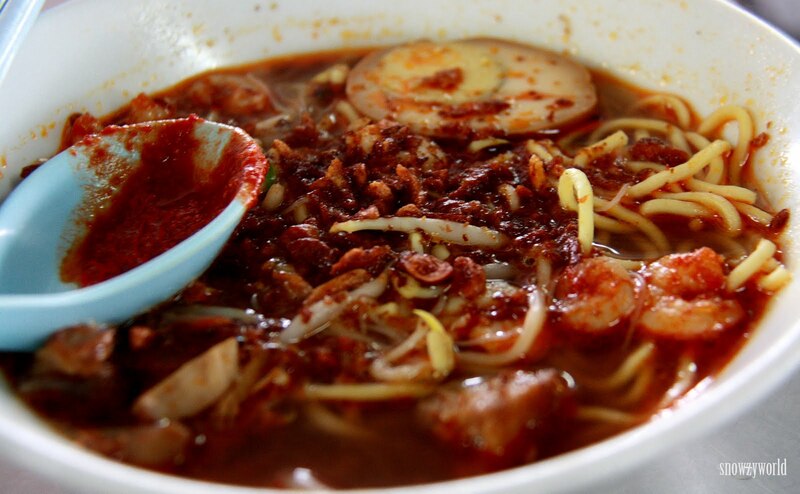 Do explore and indulge yourself in this food paradise of Penang.